The SLVMS library collection, housed on the top-floor, consists of nearly 12,000 books, including 5,000 brand-new hardcover books. The collection consists of up-to-date reference materials, curriculum based non-fiction and biography sections, and a wonderful mix of classic literature of the past and the best new fiction of today. SLVMS subscribes to many popular and educational magazines which we house in the library, as well as access to an online library catalog. The library also has three desktop computer stations, two B/W printers, and one color printer for student use. In addition, students in the library may play with the several board games or take advantage of a wide variety of art supplies available.. 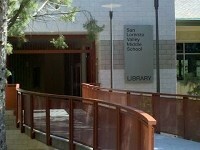 The library also houses the brand-new Middle School Computer Lab. The SLVMS Computer Lab features 33 state-of-the-art Mac desktops, and a teacher work station with a document camera and ceiling projector for technology-based instruction. Students may use the library before school, during brunch and lunch, and after school to work on homework, study for exams, type papers, conduct research, quietly play games with friends or draw, write, and especially to READ! Teachers may bring their classes into both the library and the computer lab during classes, all day, every day. The library also gives SLVMS a functional and beautiful setting for meetings, before and after-school clubs, academic enrichment activities, and tutorials.